I'm describing the bright colors of our fave native perennials. These hard-working superstars will bloom all through the summer with a little care and occasional deadheading to promote even more blooms. ASTER - offers hundreds of species across North America. Asters prolifically naturalize to cover large sunny, dry prairies. Excellent border plant in a broad array of colors from pale blue to regal purple. Asters bloom from July through the first hard frost. Butterflies, bees and wasps and other pollinators love the abundant nectar. COREOPSIS, also called 'Tickseed' comes in a range of warm colors from pale yellow to gold to rusty red and combos of these colors. Ray-shaped flowers dance on thin stems about 18-24" tall, perfect with mid-height native grasses like little bluestem or prairie dropseed. ECHINACEA or coneflower should be in everyone's garden, right? The common name comes from the 'cone' of densely packed seeds in the center of the petals. Songbirds love the seeds, and while you can grow plants from seed, most people prefer to used root cuttings or plant divisions. All parts of the plants have medicinal value, from the flowers to the roots. LIATRIS, or blazing star, is the queen of sequel blooming. With at least nine species you can plant, you'll enjoy their lavender to deep purple spikes from spring through fall. Once dominant on the Grand Prairie, blazing star does remarkably well in home gardens. Its unusual characteristic of blooming from top to bottom makes the blazing star a good choice in fresh-cut floral arrangements. The spiky foliage and pods of rattlesnake master make an interesting companion for blazing star in cut arrangements. MILKWEED - Swamp or rose milkweed is the host plant for migrating #monarchs. Fragrant, rose-colored, dome-shaped flowers form seed pods in fall, which break to reveal seeds that disperse in the wind. Deer resistent, milkweed grows in average to moist soils and is a great choice for bioswales and rain gardens. Butterfly milkweed is also a favorite for attracting and sustaining butterflies. Unlike its cousin, swamp milkweed, this fiery orange bloomer prefers a dry, well drained location to survive and set seed. MONARDA is a must for butterfly and hummingbird gardens with whorls of nectar-rich tubular flowers at the tip of each stem. Grow this pollinator favorite in full sun or part shade with moist, but well-drained soil. RUDBECKIA has 'black-eyed Susan' flowers, which bloom profusely with showy gold petals and dark brown centers. YARROW has the flat-topped umbrels of tiny flowers to that make the classic butterfly landing pad. Tough, drought-resistant plants bloom all summer in colors that range from white to gold to reds. We always include these perennials in #Bluestem landscape designs. With beauty, performance and the benefits they give to watchable wildlife, what's not to love? Contact to start a conversation about a new, easy-care landscape for your home or business. 'RIGHT PLANT, RIGHT PLACE'. We've all heard that mantra. But, there are some plants that have NO PLACE in the landscape. These species are THE INVASIVES. And, as beautiful as each may be, they are destructive in the natural landscape. They are the barbarians at the gate of biodiversity. Each invasive is highly adaptable and once they get a foothold are difficult to control in your landscape or when they escape into wild areas. Invasive species reduce biodiversity and critical wildlife food and habitat. The good news is there are MANY GREAT NATIVE PLANT ALTERNATIVES to invasive plants or overused ground covers, shrubs and trees. Here are just a few of our “most UN-wanted” barbarian plants. Pachysandra, or Japanese spurge, is an invasive evergreen perennial INVASIVE GROUND COVER that spreads throughout the garden by means of underground stems and roots. If you have this ground cover and want to eliminate it, you have three OPTIONS FOR PACHYSANDRA ELIMINATION. COVER IT UP. Cover the entire planted area with black plastic. With black plastic, the sun will heat the soil under the plants and the plants will be deprived of sunlight and water. It takes a long time, though...three months to a year to completely kill the plants, more in shady areas. POISON IT. Chemicals like glyphosate (Roundup) are the "last resort" method for large or troublesome patches. But, use with care. Glyphosate will kill any vegetation it's sprayed on and can also drift in wind or runoff. The BEST OPTION is to never plant pachysandra, but rather CHOOSE A SHORT NATIVE SPECIES like wild ginger, barren strawberry, or one of the many cool, short sedges. If you can go a bit taller, look into native ferns, wild geranium, or a medium-short native grass or sedge. One of the most insidious of all INVASIVE SHRUBS is bush honeysuckle, which includes two species, Morrow's (Lonicera morrowii) and Amur (L. maackii). You'll find this pest shrub in a wide variety of natural landscapes, even those without previous disturbances. There are several control measures including prescribed burning, hand pulling seedlings, cutting and herbicide treatments. Spring PRESCRIBED BURNING in fire-adapted communities will kill seedlings and kill the tops of mature plants. "Bush honeysuckles readily re-sprout and repeated fires are necessary for adequate control. It may be necessary to burn annually or biennially for five years or more for effective control." HAND PULLED sprouts when soils are moist. All of the root should be removed or re-sprouting will occur. Physical removal by hand-pulling smaller plants or grubbing out large plants should not be used in sensitive habitats. Open soil and remaining root stocks will result in rapid re-invasion or re-sprouting of honeysuckles and other exotic species. HERBICIDING cut honeysuckle stems. After cutting with brush-cutters, chainsaws or hand tools, apply a 20-percent solution of GLYPHOSATE to the cut stump by low-pressure spray or by wiping the stump with a sponge applicator. This method should prevent re-sprouting. Callery, or Bradford pear, is an invasive, exotic species that crowds out native plants and fails to support wildlife. Callery pear, (Pyrus calleryana), commonly known as ‘Bradford pear’, is a deciduous INVASIVE TREE that was brought to the United States in 1917 from China. It was thought that a hybrid species between the imported tree and the common fruiting pear would improve disease resistance in fruit crops. The Bradford cultivar also caught on as a new landscape ornamental during the 1950s and a number of subsequent cultivars continued to come on the market. While individual cultivars are self-sterile, different cultivars are known to cross-pollinate, producing fruits and viable seed. Spread occurs when the fruit of these hybrids is eaten and distributed by birds and other animals. A single 'escaped' Bradford pear tree can spread quickly by seed and vegetative means to form dense thickets. Even a few of these trees will outcompete native plants and woody seedlings around them, including spring wildflowers. BRADFORD PEAR CONTROL includes PULLING young seedlings, or CUTTING and treating stumps with a 25-50% GLYPHOSATE solution. Like bush honeysuckle, because of the persistent seed bank and potential for resprouting, vigilant observation and retreating of an area may be required for several years. NATIVE TREE OPTIONS that are equally ornamental include flowering dogwood (Cornus florida), serviceberry (Amelanchier sp. ), wild plum (Prunus americana) and hawthorn ((Crataegus sp.). Chinese silvergrass (Miscanthus sinensis) is a tall, elegant but INVASIVE GRASS that forms plumes of seed easily spread by wind. REMOVE INVASIVE SILVERGRASS from your landscape by cutting off the seed heads, placing them in a garbage bag and disposing of them. The following spring, dig up the plant and remove or chemically treat the stump when growth begins. Cut the previous year’s growth to about 12” tall and spray with glyphosate. You may need to repeat this process to completely kill the plant. NATIVE GRASS OPTIONS that are both beautiful and beneficial to watchable wildlife include little bluestem (Schizachyrium scoparium, prairie dropseed, (Sporobolus heteroplepsis), indiangrass (Sorghastrum nutans)and feather reed grass (Calamagrostis acutiflora). Natural selections and cultivars of these are also well-behaved choices. Native prairie dropseed is an elegant, mid-height grass that blends beautifully with wildflowers and other native grasses. With a little planning, you can plant butterflies. There are two kinds of gardens The mundane where gardening tasks are a boring chore, and the creative where any time spent there can be both therapeutic and inspiring. The difference is in giving thought to WHY one plants a garden to begin with. Most people put more thought into a grocery list than their planting list. Groceries will be consumed in a few days, but you can be stuck with hastily selected plants for years. Are you planting for color and cutting? To create an elegant and tranquil sanctuary? Or, maybe to invite butterflies? You could do all three with thoughtful planning. Then, with the end in mind, you can plant future memories and butterflies, not just flowers. Butterflies prefer the structure of flat-topped, "landing pads" like coneflowers, asters, and lantana to collect nectar. Plant for a succession of blooms to support the delicate visitors from spring through fall. You also want to consider plants that invite butterflies to lay eggs or feed larvae, like milkweed for monarch butterflies. Annuals like marigolds and zinnias will attract butterflies, but a garden filled with native perennial butterfly favorites will come back and increase year after year. Additional butterfly attractants include sand beds that hold shallow puddles of water, and food items, like soft, decaying bits of fruit. This tiger swallowtail is enjoying sipping nectar from an orange lantana. Next, consider your available space. Are you creating a small bed, or planning an entire yard? Larger areas can accommodate shrubs and trees, which can provide both food sources and butterfly nesting habitat and shelter. This sketch was created for a pair of complementary butterfly gardens in an area of about 600 square feet. Note, the larger shrubs like ninebark are used as a backdrop to smaller perennials. Color is a matter of personal taste, but a larger butterfly planting, like any designed landscape, typically considers the color and style of a home or building for overall curb appeal. Informal gardens often have a light-hearted variety of bright colors. More traditional landscapes will keep to a simpler, more subdued palette. Monochromatic plantings, especially those in whites and creams, are both soothing and sophisticated. White flowering plants are beautiful in moonlight. Moonflower, gardenia, tuberose, nicotania and jasmine have the added plus of heightened fragrance at night. In addition to sheer enjoyment, many love to photograph visiting butterflies, or use the moments to educate children. Done correctly, butterfly gardening can help support migrating butterflies and increase their local populations. Beautiful and fragile, monarch butterflies weigh only a few grams and live a matter of weeks. Monarchs are known to make long, annual migrations of nearly 2,000 miles between the Great Lakes region and Mexico to escape cold winters. The journey involves millions of the delicate insects and requires producing several generations along the way. Recently, researchers from the University of Guelph and Environment Canada have discovered a fascinating twist that proves some monarchs deviate from the traditional path, cross the Appalachian Mountains, and produce a new, east coast generation. The groundbreaking study solves the puzzle of why monarchs appear later on the east coast than the interior U.S.
Monarch numbers are declining. Some reasons are temporary, such as weather. According to a monitoring report carried out by WWF and Conanp, monarch numbers in Mexico were down by about 15% in 2017-18 due to two tropical storms and three hurricanes on two occasions in the Atlantic coasts in mid-September of 2017, when the migration begins. Other reasons for the monarch decline are more permanent, and ominous including development and agricultural practices. The longterm survival of monarchs is connected to their specific diet of milkweed and the dramatic loss of the native plant. According to the Center for Biological Diversity, there has been a 99% reduction in milkweed in Midwest croplands since 1999. Development is consuming 6,000 acres per day, a loss of 2.2 million acres annually. Other studies cite the overuse of herbicides and increased use of genetically modified crops, especially seeds containing glyphosate, as major factors in habitat loss. You can help monarchs and other pollinators by reducing herbicide use, planting shrubs and trees that provide shelter during migration and including native milkweeds in your yard and habitat patches on your farm. Interested in working together to restore native habitat? Let's start a conversation! Email Judy Allmon @ BluestemServices@gmail.com, or give me a call or text at 573.230.1196. My career started in the late 70s and early 80s in the golden age of affirmative action. To me, it was a double-edged sword. The affirmative action program gave me and other women the chance to prove our worth in the marketplace and move more quickly into management, professional, and technical occupations along with other minorities. But, the cloud of 'she's just an affirmative action hire' was there, too. I often felt I had to work twice as hard and give twice the results to be thought (or paid) half as good as a man. * WOMEN INCREASE INCOME, SALES and EQUITY - Fortune 500 companies with at least three female directors enjoyed increased returns on invested capital of 66% or more, return on sales increase by 42%, and return on equity increase by at least 53%. * WOMEN BRING INNOVATION - In a study by Dezsö and Ross of 1,500 U.S. ﬁrms in the S&P, female representation in top management improved ﬁnancial performance for organizations where innovation is a key piece of the business strategy. * WOMEN'S IDEAS RESONATE - In 2012, a NCWIT analysis of women's participation in IT patents found that U.S. patents produced by mixed-gender teams were cited 30% to 40% more than other similar patents. * WOMEN BRING INTELLIGENCE TO THE TEAM - A study from Professor Anita Woolley, an economist at Carnegie Mellon, revealed that teams with at least one female member have a higher collective IQ than all-male teams. * WOMEN ADD ORGANIZATIONAL STABILITY - Gallup has found that companies with more diverse teams (including more women) have a 22% lower turnover rate. Organizations with more inclusive cultures also have an easier time with recruiting. I've been proud to be a women-owned business owner for more than two dozen years. My company, Bluestem Services, is a certified Missouri woman's business enterprise (WBE) https://oeo.mo.gov/oeo_certifications/. The WBE brand gives me greater opportunities to bid on and participate in state bids as a prime contractor or as a subcontractor. But, it also gives non-WBE companies certain bid advantages when they include women like me on their teams. With increased profits, sales, innovation, intelligence and organizational stability plus certain bid advantages, sometimes the best man for the job is a woman. Interested in working together? Let's start a conversation! Email Judy Allmon @ BluestemServices@gmail.com, or give me a call or text at 573.230.1196. Leaves are one of the fastest ways to identify a tree. You can look at the leaf ARRANGEMENT on the stem. Is it a 'simple' or single leaf arrangement or 'compound' with several small leaflets on a midrib. How long are the stems? You might consider leaf SHAPE. Are the edges smooth, toothed or lobed? How does it feel? Is it smooth or rough? But leaves are not the only way to identify a tree, and maybe not even the best. And, during the winter, deciduous trees don't have their leaves to examine. To begin, look for TWIG SIZE and MARKINGS, SCARS from previous leaves and BUD PLACEMENT. Leaves form as either terminal buds –found at the ends of twigs, or lateral buds - along the sides of twigs. Most buds have protective scales that enclose the leaf tissue. If no scales exist, the buds are considered “naked.” The number and arrangement of the buds on the twigs are also important. Twigs are arranged the same way the leaves are arranged - either opposite from each other or alternately. Terminal buds - buds that are found on the tips of a stem or branch. Lateral buds - buds that grow along the sides of a twig or branch. Bud scales - small leaves that grow around outside of the bud. If there are no scales, the bud is considered "naked." Bud scale scars - tiny dots that can be seen inside the leaf scar after the leaf falls. Leaf scars - scars left on the twig after the leaf falls. Lenticels - small, lighter colored spots on the back of the twig. They are tiny openings the allow air in & gas out. Pith - the spongy center tissue of the twig. Vascular bundle scars - where the xylem entered the leaf and phloem entered the twig. BRANCHES also are helpful. Birches, sycamores and tulip trees have alternate branches, where twigs and buds grow off a main branch one at a time. Opposite branching, where twigs and buds grow off a main branch in pairs indicate trees including ashes, dogwoods, and maples. BARK TEXTURE AND COLOR can change with the age and geographic location of a tree, but generally helps determine the species of tree. Run your hands over the bark. Look at the color. The patchy white bark of sycamores is strikingly unique in the winter landscape. Now, note the thickness, texture, and pattern. Feel for hardness and scaliness. Is the bark peeling? For example, shagbark hickory peels vertically in large, thick, curving strips while the paper birch peels horizontally in large strips. FRAGRANCE may also come into play. For example, the inner bark of yellow birch smells like wintergreen. Common witch hazel (H. virginiana) offers yellow flowers with a banana scent long before it presents leaves. Other trees with distinctive scents are sassafras, which smells spicy and can be quite strong, and wild cherry has a bitter almond scent. During winter months only EVERGREENS like conifers and hollies, maintain leaves. Evergreen needles may be thin and soft or thick and sharp. How many needles are in each bundle? Leaves may be scales, like an arborvitae or cedar. Cones are another indication. If present, the shape and size will help distinguish from one species to another. Armed with this basic information and a good reference guide, you should be able to sleuth your way through any forest and know its trees. Keep it simple. In the exuberance of planning, keep maintenance in mind. Don't cut up your lawn with small flowerbeds, but rather think of your property as a whole and use larger, simpler beds. Bold designs with mass plantings are more striking and are easier to maintain. Many perennials, which return year after year, naturalize easily and can be used to fill in problem slopes or create meadow sites. Use short groundcovers between and under shrubs to minimize weeds and add another layer of interest. 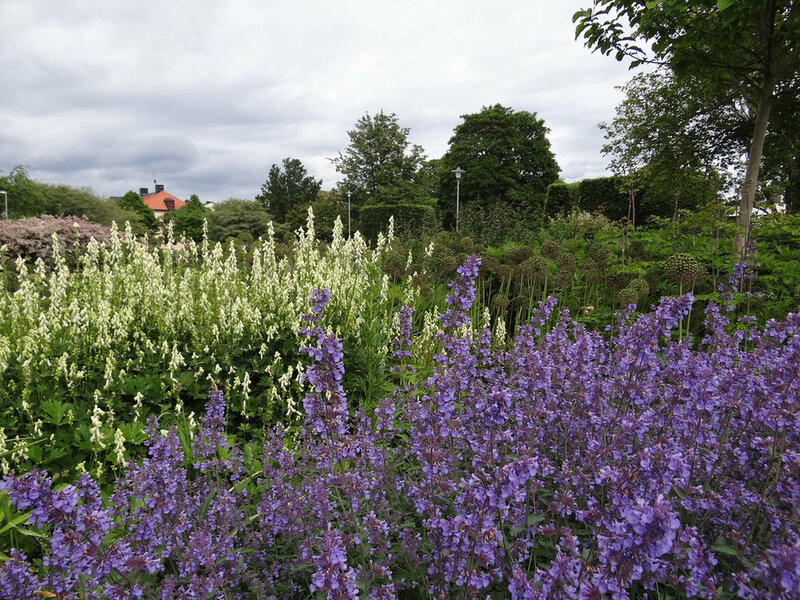 The designs of Piet Oudolf are excellent examples of bold, simple landscapes inspired by nature. Remember the cost of your new plants goes on beyond installation. Future costs of maintenance include investments of time and money through weeding, watering, fertilizing and replanting. That goes for turf, too. Don’t waste your efforts on maintaining an emerald expanse where low-maintenance paving or resilient perennial plants might serve your needs. Use grass for areas where you’ll use and enjoy it and to define and balance colorful beds and borders. Think scale and palette. Use tall growing flowers and grasses to the back, middle-sized flowers in the center and low growing flowers in the front so you can enjoy them all. Use plant colors and textures that complement your property and existing plantings. Think about seasonal blooms, but also the colors and textures of foliage and grasses. A winter scape of bronzed grasses and seed heads often rival the summer counterpart. If you’re unsure about color selections, tried and true color combinations are a safe bet. Traditional complementary color pairs are created with a primary color (red, blue, or yellow) and a secondary color (red with green, blue with orange, and yellow with purple). These combinations are vibrant and the colors intensify each other. By moving around on the color wheel, interesting combinations can be created. For understated elegance, try a soft, tone on tone theme, for example cream with ivory and peach. And, don’t forget white. An all-white garden is beautiful, especially in the moonlight. Go bold. Mass your colors for maximum color impact. You can also mix different species of the same genus for texture interest and extended bloom. For example, various coreopsis species offer different shades of yellow, as well as varied heights and compactness. Babies grow up. Keep mature height and breadth of trees and shrubs in mind when you plant them so that, as they mature, they will not interfere with window views and sidewalks. As a rule, use a plant’s height to guide spacing from a path. For example, a plant that grows to 36” should be at least two to three feet back from a walkway or patio to avoid feeling crowded. High and dry. Grade soil away from your home to take care of excess moisture run-off. Usually 1/8 to 1/4-inch drop per foot is ample. You might also consider a rain garden filled with deep-rooted perennials to help absorb stormwater run-off. Frame or screen views. As you look out from the vantage of your picture window or kitchen window, is the view attractive, unsightly, or so-so? Block an unsightly scene with an evergreen hedge or a grove of small trees. Create a soft, layered effect with a mixed grouping of evergreen and deciduous trees and shrubs. Similarly, an attractive scene can be enhanced with judicious plant framing. In addition, you could score the added bonus of spring flowers, summer shade or fall color from foliage, berries or bark. Depending on the placement, your plant grouping will also serve as a winter windbreak. Keep it mysterious and inviting. Use plantings to guide view lines, make separate garden spaces and create a sense of discovery. Involve all the senses whenever possible... fuzzy textures and fragrant plant materials are as memorable as visual components. Make sure your primary paths are easy to walk and wide enough for two to walk side by side. Keep ‘working paths’ safe. For example, a flagstone path from turf to a water spigot keeps your steps level and dry. If you add steps, keep their ascent gradual with a step height (rise) of six inches or less. Calculate the depth of the step by subtracting twice the rise from ‘26’. With this calculation, a step with a six-inch rise would have a run of 14 inches (26 – [2 X 6] = 14). Make it your own. Remember, a garden becomes personal when it reflects you, your locale and your interests. Incorporate colors from the room where the garden will be viewed. If you enjoy bird watching, plant nectar-rich or heavy-seeding species that develop into living bird feeders. Include statuary, collected items or found treasures to add personality and conversation starters. Interested in working together? We'd love to talk with you! Email us @ BluestemServices@gmail.com, or just give us a call at 573.230.1196. How can your old favorite plants be new and improved? Liquidambar styraciflua vs. L. styraciflua 'Rotundiloba'... I'll let you guess which is which. In much of gardening, it doesn’t matter what colors we pair. As long as the gardener is pleased with the outcome, all’s right with the world. Certain color pairings are always attractive, but, if you're not as confident in your own color sense as our young son, refer to the experts. For example, the #Resourceful palette of oranges and blues makes me think of orange pansies and #ElijahBlueFescue. Or, a border with blackeyed susans and little bluestem (Maybe selections like #Goldsturm and #TheBlues if height is an issue). What plant combos would these eight 2018 Pantone palettes inspire for you? Resourceful: A palette made up of complementary blue and orange colors combines warm and cool tones that you just can’t avoid looking at. Playful: Think "Minions." Bright yellow, lime popsicle, and all other things fun come together for this color scheme. Discretion: Playful's alter ego. Subtle hues such as Elderberry and Hawthorne Rose offer a new sense of strength. Far-fetched: With warm, earthy hues such as Cornsilk Yellow blending with rosy tones, this palette embraces many different cultures. Color aside, it does matter that we plant species with the same needs of sunlight, soil and water to have success. When plants of different needs are planted in the same bed, we set ourselves up for long battles with high maintenance and probable failure of at least one of the plants. Putting the right plant in the right place is one resolution worth making and keeping. ‘Similar sunlight and water needs’ seems easy to understand. But, when emotion takes over, a gardener’s good intentions can easily be replaced with infatuation. Beautiful color pictures persuade us to plant tender spring ephemerals next to sun-loving wildflowers or water-hogs next to veritable camels of the garden. Soil can also be improved by planting deep-rooted native grasses and wildflowers that slowly percolate water and nutrients into its depths and encourage mycorrhizae. As you plant areas of your landscape this year, take time to work the soil of each area. You’ll be rewarded with plants that are hardier and more vigorous as well as a garden that is less demanding. Along with using compatible plants, you’ll know your choices “DID make a difference." “Does it ever rain at your place,” I asked. “Well, of course,” she replied. “Then good news! Your yard is qualified to have a rain garden!” I told her. This woman was like many gardeners. She had heard the term “rain garden” but wasn’t sure exactly what it meant, or if it would be something that would be appropriate for her yard. The term has become popular with gardeners who are interested in adding native plants to their landscape to absorb stormwater and help lessen the negative impact of runoff. What you may not know is that rain gardens can be as beautiful as they are functional. In fact, many of our most beautiful regional natives need the type of regular moisture found in a rain garden to thrive. Without such a moist site, a gardener would not be able to enjoy their bright, ample blooms or lush foliage. An added bonus is that most of these wildflowers attract butterflies and hummingbirds. The moist soil of a rain garden supports vigorous growth from large-flowered, deep-rooted native plants like Joe-Pye Weed (Eupatorium maculatum), Rose Mallow (Hibiscus lasiocarpus) and Queen of the Prairie (Filipendula rubra ). Unusual wildflowers including snapdragon-like Rose Turtlehead (Chelone obliqua), elegant Blue Lobelia (Lobelia siphilitica) and the frothy plumed Goat’s Beard (Aruncus dioicus) are just a few more natives to consider. Natural selections from regional natives will also work well. If you decide to add a rain garden to your landscape, it can be done as a weekend project. First, you’ll have to do some planning and figuring. To establish the size of your rain garden, calculate the square footage of the area where rain will fall and runoff. For a home, figure the square footage of the home, not that of the roof. The roof pitch doesn’t change the amount of rain that falls on your home. Take that square footage, divide by the number of downspouts and then divide by 3 for the square footage of an optimum-sized rain garden on well-drained sites with sandy, loamy soils. For example, let’s take a 1728 square-foot home with four downspouts. To plan a rain garden for one downspout, divide 1728 (the square footage) by four (the number of downspouts) and then by 3 to discover you should have a 144 square foot rain garden to treat the stormwater from one downspout. To calculate the number of plants planted on 18” centers, divide 144 (the square footage of this area) by 2.25 to find 64 plants. If your soil is extremely compacted or clayey, double your square footage figure and increase the size of your rain garden, OR amend your rain garden’s soil (50-60% sand, 20-30% topsoil, 20-30% compost). Most important, create a rain garden of some size. Even if your space is limited, you can benefit from a rain garden and help improve our area’s management of stormwater. Even small rain gardens add benefit when you think of the aggregate potential in a community. Once the size is determined, layout your garden on the downslope of your home at least 10 feet away from its foundation. Use a rope or garden hose to test different shapes for your garden’s footprint. Within the footprint of the rain garden, create a slight depression by excavating three to five inches of soil. This also helps by removing existing vegetation. Mound this soil in a shallow berm on the downside of the garden. If your soil is extremely compacted or clayey, tilling a mixture of sand and peat into the soil will help improve the rain garden’s absorption until the native plants mature. Arrange your rain garden plants. Group your plants with height, color and seasonal bloom in mind. Don't overlook moisture-loving woody shrubs and small trees; in addition to their absorptive contributions, they offer year-round structure. During the first season, woodchip or gravel mulch will help prevent weeds during garden establishment. A quick weeding may be needed once a month and removing spent flowers will help prolong blooming. If your garden does not receive about one inch of water per week during the growing season, supplemental watering may be needed to keep plants blooming. Fertilization is not necessary; however, use of a slow-release fertilizer or root stimulator at planting will reduce planting shock and increase plant vigor. To encourage new growth, do a late fall cleanup. Cut back plants to six inches tall and remove dead vegetation. After several seasons, you may divide large clumps and create additional gardens. Think bold. Moisture-loving plants will grow taller and more robustly than their dry-site counterparts so allow for plants to grow up, fill out and have room. These vivacious plants look out-of-scale in smaller gardens, but their scale works well with rain gardens that typically are 70 square feet in size or larger. Don’t forget your greens. Native grasses, rushes, and sedges provide textural contrast with large-leaved plants as well as year-round interest. Plan for change. You can get extra zip from any garden design by planning for a change of color scheme. A pastel spring palette of rain garden bloomers like Goat’s Beard, Marsh Milkweed (Asclepias incarnata) and Blue Flag (Iris versicolor) will give way to a stronger fall color scheme of violet, red and gold with New England Aster (Aster novae-angliae), Sweet Coneflower (Rudbeckia subtomentosa), Cardinal Flower (Lobelia cardinalis) and Riddell’s Goldenrod (Solidago riddellii). If you’re not sure about how to select plants, or how to design, site and install your rain garden, don’t worry. You can always contact Bluestem for ideas on your rain garden design, installation, and maintenance. Our specialists can provide anything from general site recommendations to a unique rain garden design and complete installation---or give you something in between. Sustainable plantings, like rain gardens, offer wonderful opportunities to engage your family with nature.